It’s a pattern. And I’ve started to take notice of it. I wonder to myself, What exactly makes my characters’ deaths sad? How am I hurting my readers? ~ Make the reader love him. Actually, I realized this a few years ago: if you want a character’s death to affect the reader, the reader needs to have established a bond with him already. [Abundant spoilers] Here’s an example – how about Newt from The Maze Runner? Or Rue from The Hunger Games? Or, if I dare even go there, Tris from Divergent? Each of those characters were, in one way or another, attractive to the reader before their time came – Newt protected his friends and showed great loyalty to them (and he was British, which is an instant plus). Rue was the youngest tribute in the 74th Hunger Games – which make her an automatically pitiful character, from a reader’s standpoint – and she showed kindness to and helped Katniss. Tris was selfless and cared about her peers. Fact: sometimes your characters’ reaction to a loved one’s death is sadder than the death itself. [More spoilers] I have more examples, and it’s The Hunger Games: Mockingjay. It isn’t Prim’s death in itself that broke the reader’s heart, but instead Katniss’ angry, tearful reaction when she told Buttercup the cat. The reactions of the deceased’s peers can, and should, complete the scene. Think about his parents’ response to his death, his siblings, his best friend, his lover … etc. ~ Make him fight death … or don’t. I know I keep using the same examples, but I’m referencing Newt again. When he found out he had the Flare, he didn’t fight it – he got important things done, and when the time came, he welcomed death like an old friend. ~ Give him something to live for. Every character needs goals, there are no exceptions. If he has a valid reason to keep fighting, then the reader can connect with him more – these are the basics of character building. If you want your character to die a fulfilling and complete death, be sure that he’s accomplished his main goal first. But if you feel the need to totally break your reader’s heart (which you probably do, if you clicked this article), let that goal go unfinished. Cruel, isn’t it? Letting your protagonist kill the other main characters isn’t something I recommend you do often, but every once in a while it works as a huge plot twist (if you play your cards right). Or you could do it for some character development, like when Tris shot Will and it affected her for the rest of the series. Hi Sam! I’ve always loved this post, so much in fact that I printed it. But I have a question. What are your opinions of killing off a main character? I’ve been thinking of killing off one of my three main characters at the end of my series, but I was also wondering what that would do to the readers. Makenna’s always told me that it’s better to let your story live on instead of just killing off all your characters. Thoughts, please tell! Thanks! Killing off main characters may well be one of the most argued-over topics in writing. Most people will advise you against it – however, in my personal opinion, I don’t see a problem in killing off a main character. Sure, it’s sad for the reader (and the writer! ), but, if done right, it can be very rewarding. 🙂 In fact, there are a lot of popular books out there, namely in the YA genre, in which a main character dies. But the books are still popular regardless! All in all, I suppose it just depends on you. It always helps when you have more than one main character, like in your case, so that it’s easier to continue the story even after that character is gone. Great post, Sam! 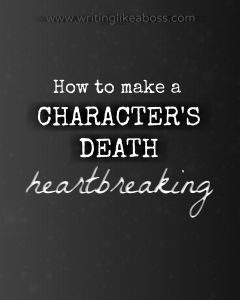 If a character’s death is heartbreaking to a reader, that means the reader feels emotion towards the characters in the story. If I can make my readers feel emotion toward characters that aren’t even real, I will be happy with the way my story is turning out. I do have a question, though. 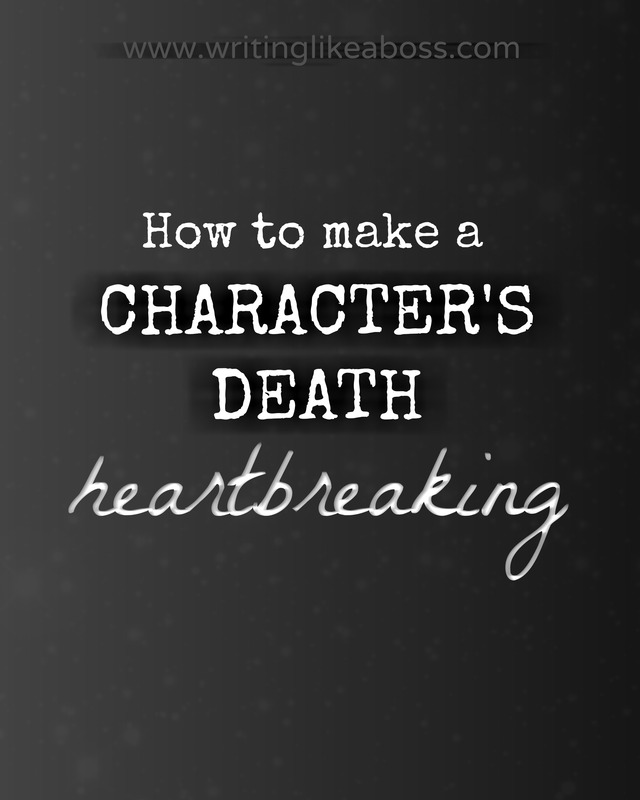 How do you know if you should kill off a character? Thank you! I always love positive feedback and ideas! I just now realized this post was a year old, sorry! Anyway, I’m thinking about killing off one of the main characters, who happens to be the other main character’s brother. It would be soon after he and his sister reunited with their father, whom they believed to be dead. My idea is that it would bring she and her father, who “died” before she was born, closer together. Do you think this is a good idea, or would it upset readers too much? Thanks for responding! I do think killing off the brother would bring the sister and her father closer together, actually. Maybe they can relate to/find comfort in one another in their grief? I don’t think that’s a bad idea at all! Of course, it’s tragic – assuming the brother is a good character, your reader will grieve for him. But sometimes that’s a good thing, right? We want the reader to be emotionally involved in the story. Anyway, I think it’s a good idea! 🙂 Good luck with your story! That’s true. It will be tragic for me, much less the reader! Thank you again! Next Post Writing like a Boss First Anniversary!